NOTE: These are OEM Length lug bolts and are NOT meant to be used with wheel spacers. Most BMWs from 1990s and 2000s. Will not work on 7-series, SUVs, and newer 2010+ F Chassis. 1) Measure shank length of OEM bolt (Threaded portion, starting at end of the seat to the end of the bolt). 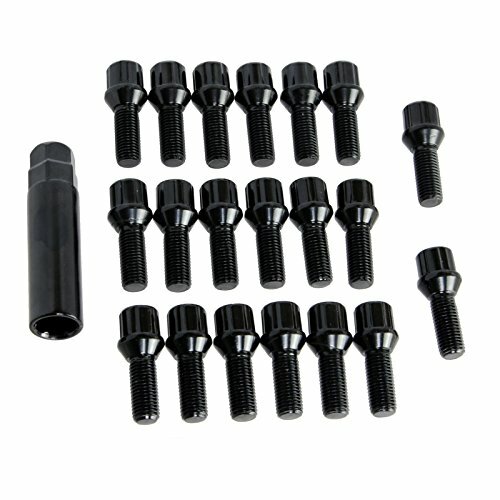 2) If your shank length is 26mm, these lug bolts can work for your application. - Shank Length: Verify this 26mm Shank Length Bolt is the correct size. Buyers must measure their OEM bolt and spacer to determine if this is the correct length. [CHECK SHANK LENGTH] Vehicles come with a variety of bolt lengths. This 26mm Shank Length bolt may not fit if it is not the same size as your OEM lug bolt.